Avon Meadows is an area of water meadow near Pershore, the Council has created two lakes and a wooden boardwalk around and over the marsh areas for people to visit and admire the wildlife. Areca Design was tasked to bring the Water Meadows to life digitally. An artist was commissioned to create a map of the area with all of the creatures you would expect to find illustrated on the map. This map is on leaflets and interpretation signage at the entrances to the Meadow. 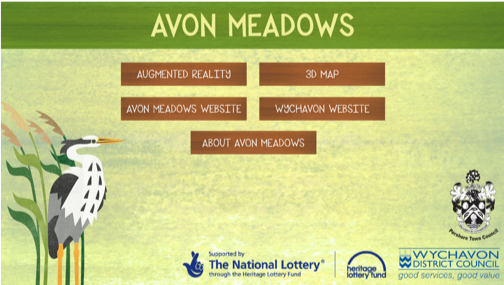 When you are on site, The Avon Meadows app also includes an in-situ view of all of the meadow flowers in bloom, overlaying the real scene, so viewers can witness full-bloom at any time of year. Click on 3D map to see this in action. Next stages include a timeline to show creatures throughout the seasons, coming and going and also the different meadows throughout Worcestershire. Again, with a timeline slider to illustrate the decline in meadow habitats and what we can all do to help save them.